Today I have a guest post written by Acadian Home. Since I have been working on my kids' bedrooms, I thought this post would be perfect! Make sure to come back Sunday, my latest "So Canadian, eh?" will be visiting! And Sunday is the last day to enter my fabulous giveaway! Hi all! I'm Jennifer and I write for Arcadian Home Decor, an e-commerce website which offers top quality interior and exterior home accessories at terrific prices. I work as a guest blogger focusing on interior design, home furnishings and art for ArcadianHomeDecor.com. I've been writing about home decor since I graduated from a university and have loved it ever since. I'm addicted to patterned fabrics, Jonathan Adler, chaise lounges, old doors, milk glass jars, antiques, and more. I spend my days working from home, perusing catalogues and home decor blogs and the slews of press releases I receive from major PR agencies, with my pup Theo snoozing in my lap - what a life! I loved searching for beautiful spaces for this guest edition. Check out some of the theme ideas that caught my eye. Take a look and let me know what you think of them! Looking for a way to up the style factor of a bedroom? A great home decor idea is to create a theme. Once an overall theme has been established, it is that much easier to choose colours, wall art, table decorations, lighting and more. Want a theme for a dream? Here are some bedroom ideas to turn an ordinary space into a dreamy customized retreat. In the dead of winter, nothing will warm things up more than a tropical oasis-themed bedroom, with a lovely tropical ceiling fan, sheer curtains, and a variety of lively colourful patterns on the bed. Soft colours, a sweeping canopy and a flower vase filled with yellow tulips evokes a sense of stylish serenity. Cozy and traditional, a country classic bedroom looks complete with a delicate chandelier, crisp white furniture, white linens and a floral rug. A flower-inspired bedroom is both elegant and fun when patterns are mixed (floral and stripes), and table decorations include small flower vases with freshly-cut blooms. Like the bright lights of Tinseltown, a fab black and white theme is all-Hollywood when paired with metallic light fixtures and bold geometric shapes. A bedroom can be like a modern art gallery, with statues as well as canvas wall art on display. 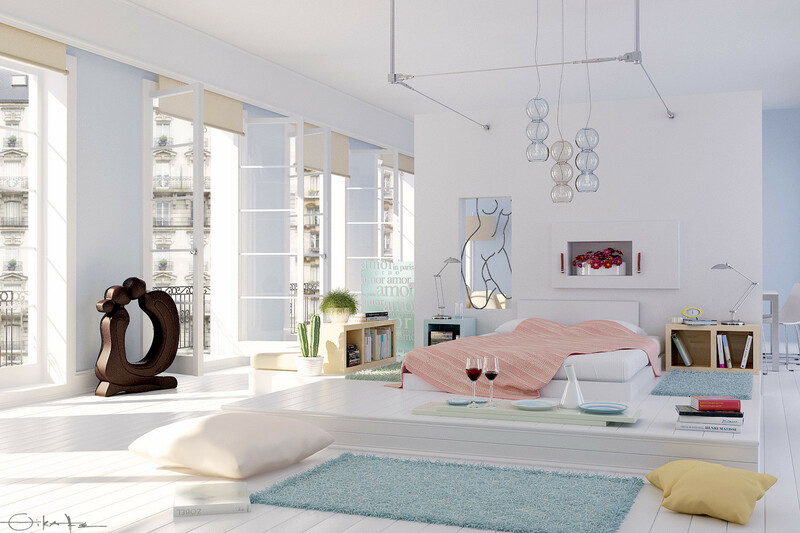 A white palette and low, minimalist furniture allow the artwork to become the focal point of the space. Faux fur, a mirrored table and a crystal chandelier ooze royal sophistication, while pale grey walls and white table lamps add some hushed style. Mother Nature reigns supreme in this nature-inspired bedroom - the innovative "tree" bed frame and organic wall coverings are the pieces de resistance. Care to tell us which one was your favorite? Make sure to comment below to let us know! Content provided by Arcadian Home Decor. Hope you enjoyed the visual treat! Love the artistic flare room! Gorgeous! Hmmm, can't decide whether I'm more in love with Vintage Glam or Artistic Flare! Thank you for letting us do a guest post on your blog. It looks lovely! Tough choice between Country Classic or Regal Elegance. Althoug it's a bit perfect for my taste, that floral room is really, really, well-done. 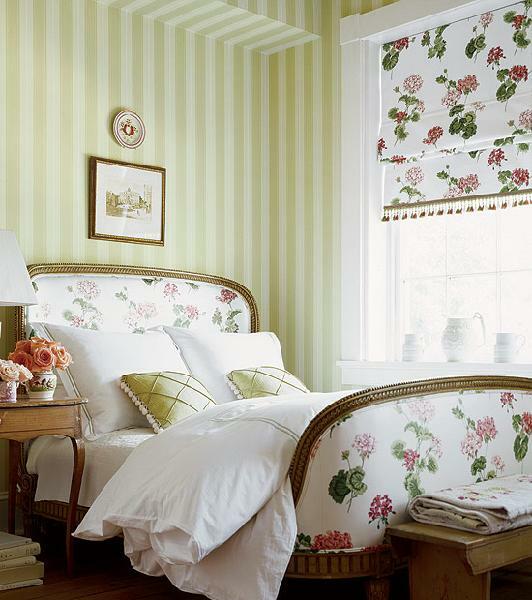 And I love the boldness of that print on the bed, rather than sticking with a safe neutral.It really makes the space! Have great weekend, Barbara! I love the blue walls and canopy bed in the 'Calming Chic' image. The 'Regal Elegance' bedroom really speaks to me - the mirrored vanity, fabulous chandelier, soft colours and amazing textures. It's so elegant and glam! Regal Elegance is my fave.